Our Equity and Employment Lead Osivue Isteumah and past Equity and Employment Lead Mana Sadegihpour will be participating in a webnair held by YouthRex on Tuesday, September 18th regarding the barriers to meaningful employment for young people in our communities. Tune in! I first heard of the Toronto Youth Cabinet in 2016, when the TYC was advocating for financial literacy to be added to the high school curriculum. Although I wanted to be involved, shortly after I went away for an internship and was unable to participate. When I came back to Toronto, I saw the city in a completely different light and wanted to apply my skills in accounting and finance while exploring interests in my budding interest in city building. In January 2018, I made my first deputation and felt empowered providing my opinions on the city's budget, and knew that the TYC was the perfect space for me to contribute to our city's civic process. I have been the Budget lead since May 2018. In my role, I have learned so much about the city that I would have never had the opportunity elsewhere. The budget provides those who monitor it closely into our city's intricacies, but working with community organizations, other working group leads and our youth from all over the city has made this opportunity an incredibly enriching one. Above all, the most valuable lesson I've learned is how smart, powerful, and awesome this city's youth are, and every month's cabinet meeting encourages me in our plight to bring awareness to the budget. From a professional perspective, this opportunity has given me insight into how I can offer my skills in the management and development of the city. I have been privileged to attend city meetings, meet Councillors, and speak on behalf of the Cabinet at community meetings and to the media. Additionally, I have really enjoyed the collaboration between other working groups and our working group. My peers on the leadership team have taught me so much and always push me to greater heights. Michael Manu is the Budget Lead for the 2018-2019 term. He oversees the Budget Working Group which aims to increase youth awareness, engagement, and excitement around the City’s Budget process and investigate the effectiveness of Council's budget process and budgetary decisions as they pertain to youth in Toronto. In May 2017, following my final undergraduate exams at York University, I was fortunate to have secured a full-time permanent role at an organization in the health sector. It was not in my preferred field of study, nor did it require any of the skills that I had spent the last four years acquiring at York, but like any other young person in Toronto I was elated to have secured post-graduate employment. Fast forward a few weeks into the role, and also like any other young person, I quickly got bored of working in a role I had little interest in. Sure, it paid my bills, but I was not happy, and I wanted to do something more in-line with my interests. Then I found the Toronto Youth Cabinet. Within weeks, I had signed up as a member with the Equity & Employment working group and had begun research on a project focused on youth unemployment that piqued my interest. Each day, I looked forward to the end of the workday, when I would retire from my day-job and begin tasks that related to the research project. I started learning more about municipal governance and the ins and outs city hall. I started off going to City Hall once a month for the 2-hour cabinet meetings, and by the end of the year, I had walked past the Toronto sign in Nathan Phillips Square more times than I could count. I fell in love with City hall. I also developed personal skills during this time that were very beneficial such as report-writing, research skills. By engaging stakeholders through a series of interviews and surveys, I was able to improve my interpersonal and communication skills. It was also such a surreal feeling to experience when we finally finished the project in April 2018. I was finally able to hold a printed copy of this youth-led, youth-centered policy report that my team and I had worked so hard to produce over the course of a year. As a result, it was an easy decision to apply for the role of Equity & Employment team lead in the spring of 2018, in an attempt to develop upon our successes. Since then, it has been a year of even bigger successes and accomplishments. Since May 2018, I have participated in the If I Ruled TO conference at the City of Toronto’s Youth Week, YouthREX Webinar, TCHC YouthWorx 2018 Conference, 2018 municipal elections, Identify ‘n’ Impact grant panel, and the University of Toronto’s Institute on Municipal Finance & Governance annual City Manager address – to name a few. The City Manager of Toronto, Chris Murray, actually read the policy report my team and I worked on, and commended me on it, which was surreal! Evidently, the opportunities for personal and professional development have been endless and I have the TYC to thank for all of that. I am currently about to pass the leadership baton as I intend to complete a Master’s program in Public Administration at Queen’s University in the fall, and I feel like I have been well equipped to head into this next adventure. My time at the TYC has been filled with learning opportunities and groundbreaking experiences, and I unreservedly advocate for any young person between 13 and 25 to become a part of this movement. As I complete my time as Equity & Employment Lead, I intend to still be a part of the Toronto Youth Cabinet in any possible capacity as I remain under 25. Whether here in Toronto, our out in Kingston, I pledge my dedication towards contributing to youth development, and for any young person who is contemplating the same, I strongly advise in favour of it. I have made what I believe to be life-long friends at the TYC and I’m certain this will be the testimony of future TYC-ers! 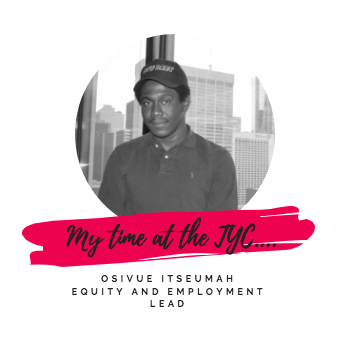 Osivue Itseumah is Equity & Employment Lead for the 2018-2019 term. He oversees the Equity & Employment Working Group which works to fight the city's rising rate of youth unemployment. Back in 2016, I was on the lookout for my next major project. I have always been very civically inclined, often joking to my peers that I’ve spent more time in volunteer roles over the past 10 years than in paid employment. I was in the process of moving back to Toronto after finishing my Master’s in Public Administration at Queen’s University. I felt like I had learned a lot about practical approaches to policymaking during grad school and I was ready to put my new skills to use. That’s when one of my friends invited me to my first meeting at the Toronto Youth Cabinet. I never looked back. During the last two years, I have held various roles at the TYC. Currently, I am the Director of Policy and Advocacy. I’ve had the fortune of working with incredibly talented young people, city officials and community organizers from all walks of life that are brought together by the mission to build an equitable, accessible, and youth-friendly Toronto. It is difficult to find the words to describe just how impactful this experience has been on my personal and professional development. Whether it was facilitating consultations with newcomer youth across the city, or leading advocacy efforts on behalf of the TYC, I have enjoyed and grown through every minute of it. Since joining, I've had the privilege of meeting with Councillors, advancing TYC's policy positions through our advocacy efforts and co-authoring various reports. I have also formed incredible working relationships and friendships that I know will last far beyond my time at the TYC. We are currently recruiting Executives, and Working Group Leads for the 2019-2020 term. You can check out the available roles here and here. If you have questions about specific positions or the organization, I’m more than happy to share my experience. Andrea Fernández is the Director of Policy of Advocacy for the 2018-2019 term. In this role, she is responsible for identifying policy and advocacy issues where TYC can intervene, researching and analyzing City policies and strategies, making recommendations to the Cabinet on policy and advocacy positions. Join the TYC 2019-2020 Leadership Team! You are expected to serve a full term from May 2019 - May 2020. This commitment will take approximately 3 to 4 hours per week, depending on the role. Meetings typically take place during the evenings and weekends, most often in the TYC Office located at Toronto City Hall. TTC tokens are provided for all transportation related to TYC work. The Arts, Culture, Development and Community Working Group (ACDC) works in collaboration with the programming team of City Cultural Events (CCE) and is dedicated to developing event specific recommendations and initiatives ensuring that youth have a voice and platform within Toronto’s cultural events. The Urban Health group will combine and link youth experts to partner and collaborate with Toronto Public Health on a variety of special interests affecting youth across Toronto. The Transit Working Group aims to advocate for transit policies that meet the needs of youth and students in Toronto. The Education Working Group strives to connect the Toronto Youth Cabinet with the Toronto's school boards in order to develop initiatives to benefit students. In doing so, we endeavour to raise awareness on issues related to youth in education at municipal levels. By developing initiatives concerning policing and violence prevention, the Community Safety Working Group strives to create a safer Toronto. The Equity & Employment Working Group works to fight the city's rising rate of youth unemployment. Housing Working Group is dedicated to creating effective strategies to build equal opportunity for youth in securing Housing. The Budget Working Group aims to increase youth awareness, engagement, and excitement around the City’s Budget process and in the Participatory Budgeting Pilot. Ensure that the overall direction given from the Cabinet is in line with the TYC’s mission statement, long-term vision and anti-oppressive framework. You are expected to serve a full term from May 2019 - May 2020 This commitment will take approximately 3 to 4 hours per week, depending on the role. Meetings typically take place during the evenings and weekends, most often at Toronto City Hall. TTC tokens are provided for all transportation related to TYC work. The Executive Director is responsible for the management of the Executive Team and the organization as a whole. Responsibilities include: creating and executing the Annual Work Plan, responding to external requests, acting a liaison with City staff, ensuring the overall direction of the organization is in line with the Constitution and membership, membership development, and working with the Coordinator on funding, policy, and personnel issues. Commitment for this position will exceed the 4 to 5 hours outlined above. The Director of Internal Affairs is responsible for the internal management of the the organization, including: human resource management, conflict resolution, developing policies and procedures for the organization, managing the member progress tracking system, membership development, and preparing for Cabinet meetings. The Director of Stakeholder Engagement is responsible for engaging existing partners and stakeholders, researching potential collaborators, assisting Working Groups in the development of relationships with external organizations, and supporting the Advisory Board. The Director of Council Relations is responsible for building relationships between Councillors and the Cabinet, supporting Working Groups in their relations with Council, reporting to the Executive Team and the membership on the actions of City Council, and furthering the relationship with the Office of the Mayor. The Director of Public Relations is responsible for overseeing all of the TYC's social media accounts (Facebook, Twitter, Instagram, Snapchat), developing and executing a digital media strategy, acting as media liaison, maintaining the TYC website, and supporting Working Groups in the promotion of projects and initiatives. The Director of Policy & Advocacy is responsible for identifying policy and advocacy issues where TYC can intervene, researching and analyzing City policies and strategies, making recommendations to the Cabinet on policy and advocacy positions. The Director of Organizational Development is responsible for planning training days, developing civic literacy materials for the membership, preparing presentations on significant civic issues to be delivered at Cabinet meetings. Budget: In a matter of weeks, City Council will approve Toronto's 2019 budget. The TYC supports the use of more revenue tools to sustainably fund City operations and capital investments. We also call on Council to maintain funding for the programs that youth rely on. Community Safety: Toronto's Youth Pre-diversion Program directs youth who have convicted minor offences to community agencies. But, do we know how effective the program is? The TYC calls for greater transparency. Education: Are we adequately supporting the mental health of Toronto's youth in schools? We could do better. The TYC calls on TDSB and TCDSB to make mental health frameworks mandatory for every school in the city. Employment and Equity: In Toronto, young people graduating from post-secondary institutions face challenges turning degrees into labour market outcomes. We call on City Council to support in reconciling the youth skills gap. Newcomer: Newcomer youth face many barriers to integration. Education should not be one of them. We call for increased supports in elementary and secondary schools and post-secondary institutions for newcomer youth. Transit: Did you know that 48% of all travel by youth in Toronto is on public transit? We call for a reliable and affordable surface transit network. Urban Health and Housing: Youth experiencing homelessness encounter many barriers in accessing harm reduction supports. The TYC calls on Toronto Public Health and the City of Toronto collaborate and track data in mandating Naloxone training, as recommended in the Toronto Overdose Action Plan. Michael Manu is paying close attention to this budget. As the budget lead for the Toronto Youth Cabinet, the official youth body advising council, he said those the cabinet represents are worried about a lack of funding for capital repairs — a billions-dollar backlog in the next decade meaning more potholes, a less functional transit system and crumbling public housing. Following our Budget Break Down and Deputation Training, we had several incredible spoken and written deputations take place across the City. Some of which caught the eye of reporters covering the budget and some City Councillors. You can take a look below at these incredible deputations! Our Budget Lead, Michael Manu, deputing Scarborough Civic Centre. Our Transit Lead, Eli Aaron, deputing City Hall. Our Budget Working Group Member, Lauren Craik, deputing at City Hall. Our Equity and Employment Working Group Member, Omar Ameen, deputing at the North York Civic Centre. Our Transit Working Group Member, Chris Gusz, deputing at Scarborough Civic Centre. Read the written deputation done by our Education Lead Ann Nguyen here. Read the written deputation done by our Urban Health Working Group member Carolyn Abel here. Our Transit Lead Eli was recently featured in the Star regarding the recent fare increases to the TTC. You can also watch his full deputation here.